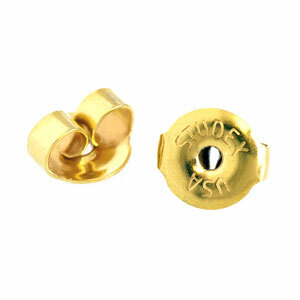 Studex spare 24 carat gold plated surgical steel butterfly backs for earrings with posts up to 0.8mm gauge including the Studex Sensitive and Studex Tiny Tips stud earrings. These butterfly backs do not fit Studex Plus earrings. Arrived sooner than expected and fits perfectly as a replacement for the back of my earrings. Very comfortable to wear. Really good backs, they stay put brilliantly just like the backs you get on piercing studs which is just what I was after. I have had no problems at all and would buy these again if I needed to.